Coinciding with a national “we won’t be complicit” day of action aimed against US Immigrations Customs and Enforcement (ICE) approximately 100 protesters gathered in Midtown to pressure tech companies, which in recently months have drawn criticism for providing infrastructural support to the agency. Amazon, while not directly associated with ICE, provides support to Palantir—a data-mining firm that does—and has sold questionable facial recognition software to other law enforcement agencies. Employees of all three companies wrote letters to their CEOs in recent months calling for these arrangements to be nullified. At the final location around 7pm, six protesters held a small sit-in, blocking the entrance to Amazon Books. 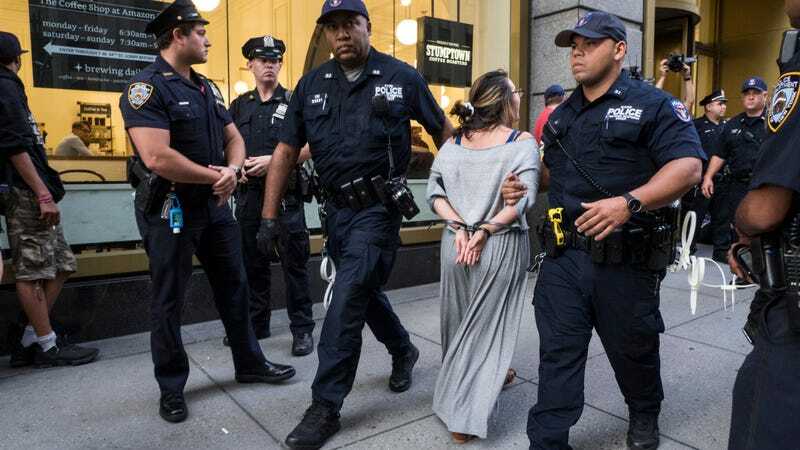 Ten minutes later officers blocked foot traffic around the store, and one approached the group with a backpack containing a speaker which played a prerecorded message warning them to disperse or be arrested for disorderly conduct. One by one they were zip-tied and led into a Strategic Response van. If you work at one of these companies and have information you wish to share, please reach out via email, Keybase, or Secure Drop.